The CR1000 datalogger improves on the CR10X hardware in many ways, but many enhancements stem from the PAKBUS® communication protocol that is part of the CR1000’s operating system. Like our other Table-based operating systems, packet-based communication in the CR1000 is more robust than the communication protocol used in the mixed-array dataloggers. With final storage organized into independently sized and collected tables, you only have to collect the data you need rather than collecting all of the data and then "splitting out" the intervals of interest. Moreover, the resulting data files use date-time stamps and record numbers that import easily into other software, making subsequent analysis easier. To these table-based advantages, PAKBUS adds unique device addressing and a powerful routing protocol, making peer-to-peer communication more straightforward and robust. Peer-to-peer communication is exploited in various ways. For example, it allows multiple "satellite" dataloggers to send their data to a "master" datalogger enabling collection from one master device. In applications involving measurement and control, peer-to-peer communication enables a "measurement" datalogger to control another datalogger over RF or other shared communication medium without a PC. Unique addressing also enables the CR1000 to initiate and control the data transfer to the PC via "one-way-data" instructions. At the PC end, LoggerNet can collect any missing records, or "holes," since the last record arrived. Another feature in PAKBUS dataloggers is support for simultaneous communication with multiple hardware devices. This means you can be monitoring a datalogger over a direct link with a PC, PDA, or keyboard/display while the datalogger is controlling other dataloggers over an RF link and simultaneously dispensing information over the phone. 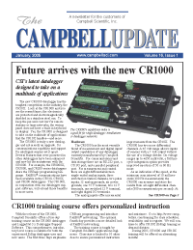 These unique addressing, routing, and multi-tasking communications free the CR1000 and other PAKBUS dataloggers from depending on the PC for triggering alarms and routing messages. When you need the more sophisticated features of PAKBUS, you'll want LoggerNet and a more thorough understanding about PAKBUS networking. The CR1000 Operator's Manual is a good place to start, but also check our Web site for the "PAKBUS Networking Guide," which explains PAKBUS networking and offers examples of hardware configurations.